I have always loved eating at Chick-fil-A. I mean, their food is delicious and manages to hit just the right spot. Sometimes, particularly when I ignore the nutrition information on the back of my Avocado Lime Ranch Dressing, I even feel like I’m eating a healthy meal. But it’s not really the food that keeps me coming back. It’s the people. In the embarrassing number of times I have frequented a Chick-fil-A, I have never once come across a disgruntled employee. They always pleasantly smile and say, “My pleasure,” when you thank them. They really do seem to enjoy their jobs. I noticed these things before I had children, but now that I am a mom, Chick-fil-A’s service seriously blows me out of the water. 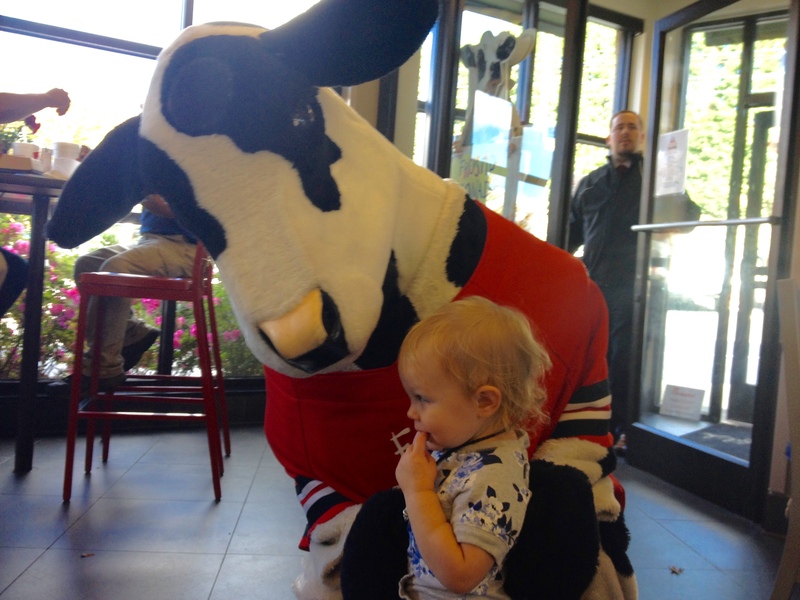 This child LOVES the cow at Chick-fil-A! When I’m with a group of friends and our children, we naturally choose to eat at a Chick-fil-A. Why? When I order, they tell me they will bring me my food. I’m not sure if this is for the customer’s convenience or their own, as I’m sure I would dump my tray of food all over the place while I navigate to a table with two toddlers. Either way, it is a blessing. When I’m looking for a table, someone usually comes by to help me find a space that’s just right. Chick-fil-A employees frequently offer to find me a high chair, placemat, hand wipes, or anything else I could possibly need while eating at the establishment. When I’m ready to go, I’ve often had my drink refilled and my trash taken up for me. With the stellar service, and all the fresh flowers, eating at Chick-fil-A basically becomes a little vacation in the middle of my day. 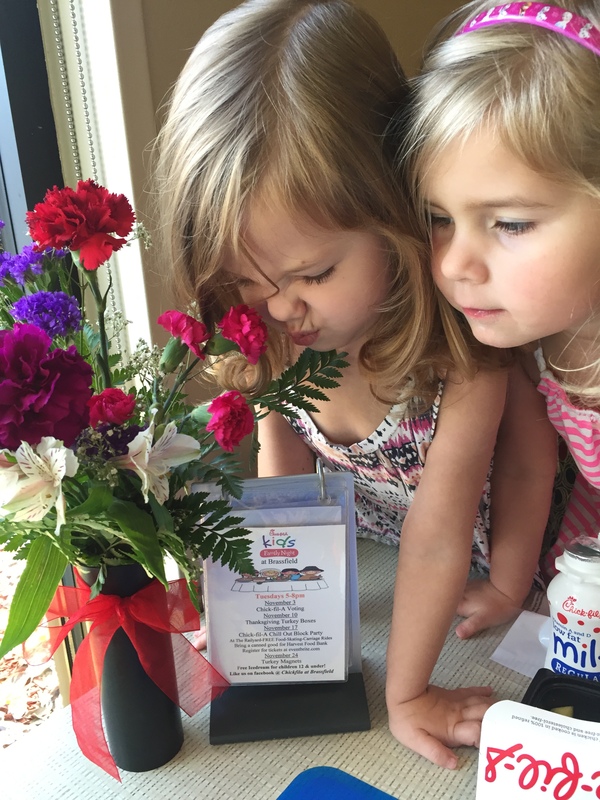 Enjoying the fresh flowers at Chick-fil-A. Throughout the years I’ve known quite a few people who have worked at a Chick-fil-A. If you are one of those people, thank you. Thank you for doing your job and for doing it well. I know you see more than your fair share of messy little ones, but please know that moms dearly love all of your efforts to help us have a pleasant dining experience. Chick-fil-a is such an honorable company! Not only do I admire their beliefs, I admire the way they train their employees. They really do seem to enjoy their jobs. My brother-in-law worked there for years before he moved and loved the environment, their focus on service and having Sundays off! I love it! 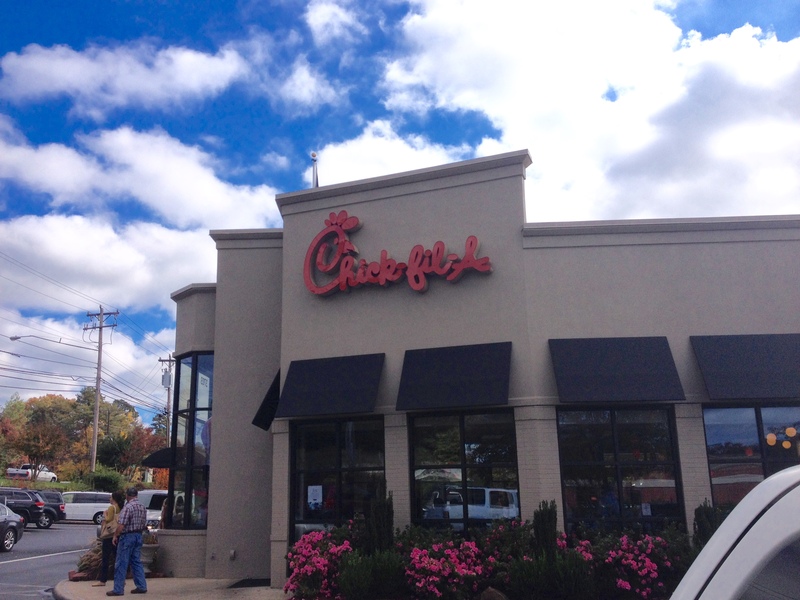 There have been so many times I wanted Chick-fil-A on a Sunday, but I absolutely love that they are not open. They have great priorities! I loved working at chickfila in high school! It was the best job!! Great company! It seems like it would be a great place to work!